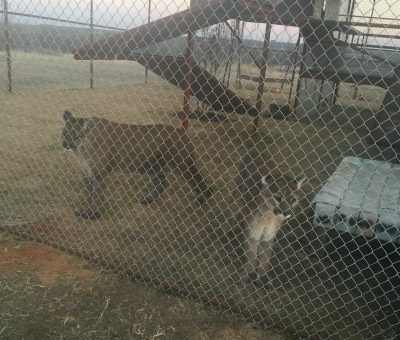 Cougars Apollo and Lakai were transferred from the Dallas Zoo to CARE last week. The move went exceptionally well, zoo staff stayed with them the first few days to help make them comfortable, and now the boys are now getting acclimated to their new home. As you can imagine, this is quite an adjustment for them. They are getting used to a new enclosure, a new vast landscape, new animal neighbors, new food and feeding schedule, and new people. All these new things can be very overwhelming and we want to make sure we are making it as easy on them as possible. Right now, they are spending a lot of time in a lock down area - it is small and protected, so that is where they feel safest. We see a LOT of paw prints each morning, so we know they are out and exploring at night when everyone else is asleep. They are understandably nervous when there is too much movement or noise, but otherwise are pretty calm. We are putting together a little video of their arrival soon. In the meantime, here are a few pics of them taken yesterday so you can see how incredible they are. Lakai is in front and Apollo in back. We will not be posting a ton of pics or vids though for the time being, we are giving them as much space as they need - that means we do not want to be in their faces with cameras all the time. No paparazzi! Once the boys have time to really settle in and become comfortable, you will certainly see more of them. We are planning a big grand opening/welcome party for them in the spring. Once they have adjusted, we would love everyone to come out and see them! We are so thrilled to have these two beautiful guys with us, and we look forward to their life of retirement here at CARE! Join us in (quietly) welcoming Apollo and Lakai!